A little while back now we were sent some Lego to build and unfortunately there was a hiccup along the way because we misplaced a vital piece of the construction which delayed things somewhat. After an intensive web search a replacement piece was ordered and sent here. 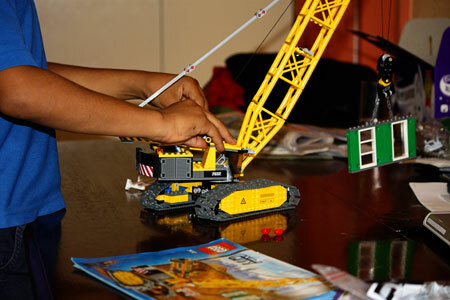 Now we have a newly built Lego Crawler Crane in the house and we also know all the places to go to find replacement pieces. Wow – that is truly awesome – especially that you then let him play with it – I am the sort of horrid mother that would put it in a glass case to admire the hardship it took!! Jeanie, I was hovering over him like nobody’s business incase it fell apart. Ohhh, love it! Looks really good. Jayne, psst, don’t tell anyone but we had to cannibilise something else to get a piece to finish it off still.